New and innovative product. 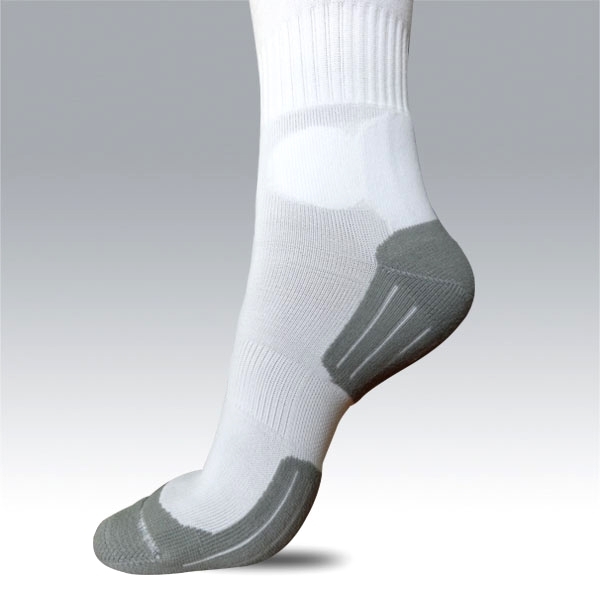 Football socks or rugby socks with foot made from anti-bacterium materials which include silver ions. Foot of sock is woven from fibres of prolen that have been enriched fibres of siltex. Fibres of siltex contain silver ions. Silver ions include some anti-bacterium substances and provide an unique anti-bacterium effect. Presence of silver ions helps to protect foot against unpleasant smells and ensures maximal hygiene even after multiple using and washing. You can say that presence of silver ions let it gives the effect of deodorant. Anti-bacetrium foot changes nothing about colours of leg part of sock. Thus socks with anti-bacterium foot are available in the same colours as other socks. To have colours chart click here. The exception is colour of foot. Due to nature of siltex fibres, foot is available in two colours: grey and black. Socks can be personalized with logo or lettering as other socks. See 'Customisation' here for more details.